If you were to look into most of the garages these days you probably wouldn’t too surprised that many of them are probably overfilled with stuff. This often makes it difficult to find the right amount of room for putting the families bikes. Fortunately, there are a number of different ways that you can maximize the amount of room you need with garage bike storage. We found several different types of garage bike storage racks that range from a single bike hanger, all the way up to a large model that is capable of holding up to 5 bicycles securely. Each one of them has a number of features that make each one of them a strong contender for the best garage bike storage. Whether you are needing a way to securely way to store a bike or any number of bikes inside your garage or storage area. After all of our research was done we put together our list of the top garage bike racks. We also added garage bike storage racks reviews for all of the bicycle garage storage racks. 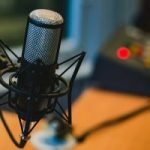 We hope that all of the information that we have provided on each of them helps you to make an informed decision when it is time to make a purchase. The Leonardo Da Vinci Bike Storage Hook System was designed to maximize the use of the small space you have to store your bike. It is made from all sturdy materials and comes with all the necessary mounting hardware. It handles most bikes up to 40-pounds and can handle most tire widths up to 2.5″. Perfect for garage and even can be used in limited areas such as an apartment or condo. The bike hook/rack storage system features an all steel body and hook that is complete powder coated and has a rubberized coating on the hook to protect the wheel. 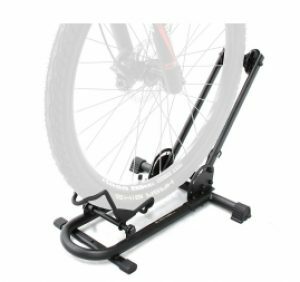 The back wheel is supported by a secondary clear plastic tray that is mounted on the wall below where you attach the hook. For best results, you want to be sure to anchor it to a stud in the wall when you are mounting it. The Leonardo Da Vinci Single Bike Storage System is perfect when you don’t have much room to store a bike. It will handle most typical bikes and keep them out of the way. 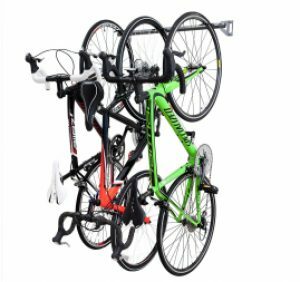 The Michelangelo 2 Bike Storage Stand is a unique storage system that is designed to take up as little amount of space in any room. The rack is very easy to assemble and is constructed of all high-quality materials so that it lasts and requires no mounting hardware. It can handle up to two bikes and a maximum weight of 80-pounds. When fully assembled it leans up against any wall without marring the surface of the wall. The bike rack/stand is made from a lightweight tubular steel that has been powdered coated for durability and long lasting use. It slips together in minutes without needing any tools and doesn’t require any mounting hardware. The unique design used gravity for support and it simply rests against any wall. 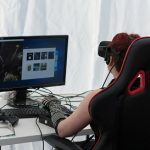 The hooks feature a unique hooking system that allows them to wrap around the tubular poles of the stand and can be repositioned multiple times. 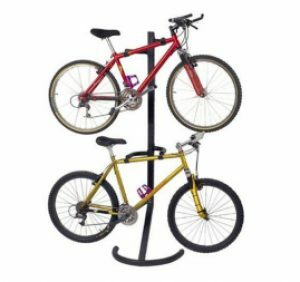 This unique bike stand/rack is perfect for a garage, apartment or even dorm room as it doesn’t mount on the wall. It assembles quickly and is very portable as well. The 4 Bike storage Rack System from Monkey Bars is constructed of all heavy duty materials and handles a total weight of 200-pounds of bikes. It is designed to make the best use out of minimalist space you have in the garage or storage space. It mounts easily to any wall and the hooks slide across the full length of the bar. The hooks won’t damage the bikes and it is sturdy enough to handle the daily use. 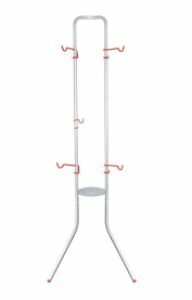 The rack is constructed from high strength tubular steel with a silver powder coating that is designed to provide many years of use. The hooks are plastic coated for extra protection for the wheels of your bikes. Depending on the size and weight of the bikes it can handle numerous of the families bikes up to 200-pounds. No more leaning your bikes up against the wall or taking up valuable floor space with the Monkey Bar storage rack. 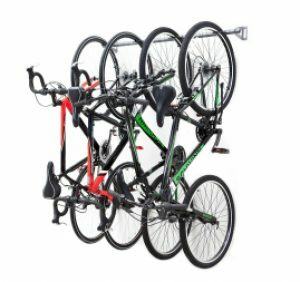 If you have more bikes that garage space to put them you really need something like this best bike storage rack and it would be a great value. 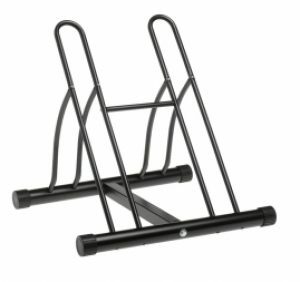 The Pro PLB-2R Bike Stand is a heavy duty space saving stand that can hold up to 2 bikes with a total capacity of 100-pounds. It made of high-quality materials and the hooks are fully adjustable to accommodate both men’s and women’s bikes. There is no mounting hardware and it won’t damage the walls. It is lightweight and can easily move throughout the garage or storage area. It is constructed from high strength steel tubing that has a durable epoxy coating on the outside so that it will hold up to years of use. The hooks are fully adjustable and plastic coated so they won’t damage the surface of the bike. It doesn’t have to be mounted, but it can be mounted using optional mounting hardware (not included). It stands 79″ tall x 26″ wide x 19″ deep and only weighs 20-pounds. This bike stand would be a really best choice if you really want to maximize the amount of storage in your garage, but not take up too much floor space. 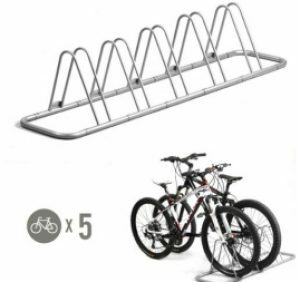 This heavy duty 5 bike storage rack is designed to organize and store up to five bikes. It is made from only the highest quality materials for strength and durability. It is light enough to be portable and each segment can be independent of the rest to support a single bike. It designed to sit on a flat, level surface of the garage or storage space. It is made from high-strength tubular steel and powder coated for both durability and great looks for many years of use. Everything snaps together and will handle up to 5 bikes at a time. The coating on the steel also helps to protect the bike’s wheel from getting damaged. The overall weight of the rack is only a mere 10-pounds and it can also be used outside as well. It is really quick to assemble as everything snaps together and can be disassembled quickly as well. This would make a great way to organize and store up to five bikes in a small space or garage. The PBS-2R Bike Stand is a lightweight bike stand that can hold up to two bikes. It is made from high-quality materials that are designed to rest on any flat surface which includes a garage, storage unit or patio. The unique design of the bike holder allows the bikes to be facing the same direction or in totally opposite directions from each other. It opens are limited in size and will not hold larger tire sizes, such as mountain or commuter style bikes. The bike stand is made from heavy duty, high strength tubular steel with an epoxy coating on the outside of all of the surfaces for extra durability and it won’t damage the wheels of the bike. Some assembly is required and you will need to have some tools handy. The bikes are held securely in place and there is no more need to lean your bike against a wall where it can easily fall and damage your car or the wall of the garage. 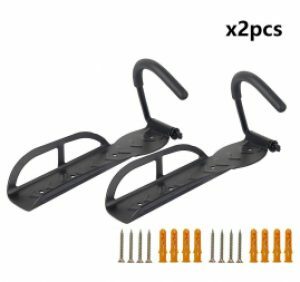 This is a really good choice if you only have a pair of bikes and don’t like to have to lean them up against the wall and risk them falling into the car. The 2-piece Bicycle Wall Hook System was designed to be used to store up to two different bikes mounted to the wall and off the floor. It is made from heavy-duty materials and yet still being lightweight. It comes with all the mounting hardware (screws and drywall anchors) and it mounts very quickly. Each hook holds a single bike up to 60-pounds, but it depends on how sturdy the wall is and whether or not you anchor it to stud in the wall or not. 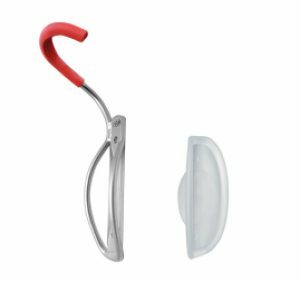 The hook is made from high strength steel and has an epoxy coating for an extra durable finish and the hook is fully covered in a foam material to protect the bike’s wheel from any damage. The package features two bike hooks, so a single package can be used to store up to two separate bikes. The minimalist design does not take up a whole lot of wall space, but by hanging it up on the wall you will have much more valuable garage or storage area floor space available. This system is perfect if you are looking for a low-cost and best bike storage solution and it looks great as well. The Homee Wall Mounted Bike Hook is a great, low-cost bike storage system that can be used inside or outside. It is made from all high-quality materials for extra durability and it will hold up to many years of use. It features a very simple design and can support bike weighing up to 60 pounds and it won’t damage the bike’s wheel. The minimalist design looks great but doesn’t take up a whole lot of space on the wall. The bike hook and mounting plate are made of high strength steel and powder coated for a very durable finish. 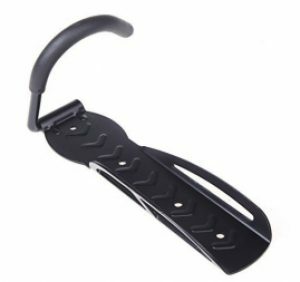 The hook is covered in a protective foam so that it doesn’t damage the bike’s wheel as it is suspended vertically off the floor of the garage or storage space. It comes with mounting hardware and it can even be mounted on a masonry wall for outside storage if necessary. Its lower cost makes it a really good choice if you are on a limited budget, but you won’t be compromising quality. The Floor Parking Bike Rack from BIKEHAND was designed to store a single bike so that it is securely held in place instead of the possibility of it falling into the car in the garage. It is made of the only the highest quality materials and is able to hold most bikes, except for those with tires larger than 2.4″ wide. It features a unique locking mechanism not found on any other brand or model floor bike stand. The Bike Floor Parking Rack is made from heavy duty high strength tubular steel with a long lasting powder coating. The floor parking rack is unlike any other single bike rack on the market as it cradles and tilts the bike in a more secure position. The uniqueness doesn’t end there as it is also extremely portable and can easily be carried on the road. It is lightweight and folds down into a much more compact size which means it can be easily packed away. 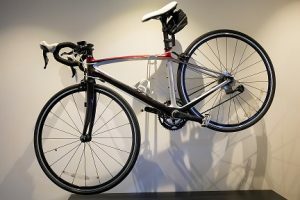 BIKEHAND has put together a great looking and highly functional floor bike rack that is not like any other and well worth the money. The 3 Bike Storage Rack from Monkey Bars is made from only high-quality materials that hold each bike in a vertical position and reduces the amount of floor space your families bikes will take up. It can be used to turn any space that is only 3 feet wide into a handy bike storage place. The unique design makes it possible fit a number of different size bikes on the same rack. The Monkey Bars Bike Storage Rack is made from heavy duty steel for extra strength and durability. The exterior of the rack is completely covered in extremely durable powder coating that will make it last a very long time. The j-hooks which are what holds each of the bikes securely in place are able to slide easily across the full length of the 3-foot bar. The hooks are coated as well so that they will not mar the surface of the bicycle wheel. The Monkey Bars 3 Bike Rack can be easily mounted just about anywhere including the wall of a small apartment or storage shed.